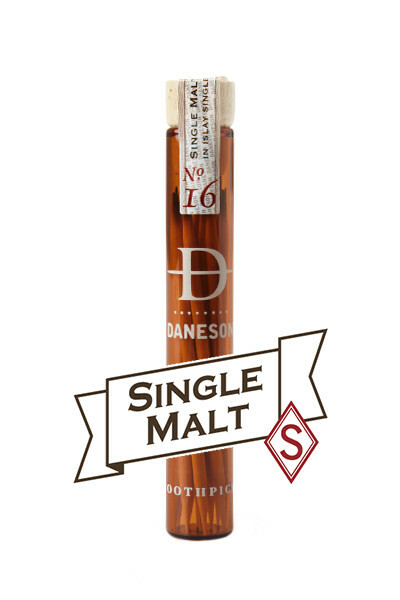 A recipe with barrel aged Islay single malt scotch from a 200 year old distillery is what makes the Daneson Single Malt Nº16 special. Unhurried, it imbues a subtle boozy peaty flavour when warmed in the mouth after several minutes. To be clear, if you're not a scotch drinker you will likely not pick up on the subtlety of Nº16 because it is soaked with premium single malt then kiln dried leaving behind flavors deep in the wood of the toothpick. As a general rule Daneson would like to under promise and over deliver - with this in mind each bottle has a minimum of a dozen toothpicks.